Mango season is still going strong and I am never happier! In the last few days, we have had mango smoothies, mango salsas, ice cold fresh mangos, mangos warm from the sun, basically every kind of mango. After making all the basic mango concoctions, I decided that I wanted to mix things up and make something different. I love things all things spicy. Sweet or savory, I want my seasonings to be complex. In fact, I am a bit of a spice hoarder…my spice cabinet is completely full and I am running out of space everywhere else to put them! I like to try and find spices and seasonings in places you wouldn’t expect. The stranger the better. My current favorite spice destination is a tiny Fijian curry shop in Kahuku on Oahu’s famous North Shore. In addition to their absolutely mouth watering selection of curries to eat at the shop, they also sell a surprisingly wide variety of spices and dry goods…and they are so darn cheap. Good quality, always an exciting new product to try, and a great off the beaten path stop for any of my visiting guests? This is the perfect place for me! On my most recent pilgrimage to the shop, I scored a big jar of green cardamom pods, a bag of star anise, AND a new kind of curry powder (for my collection, of course) all for about $7. 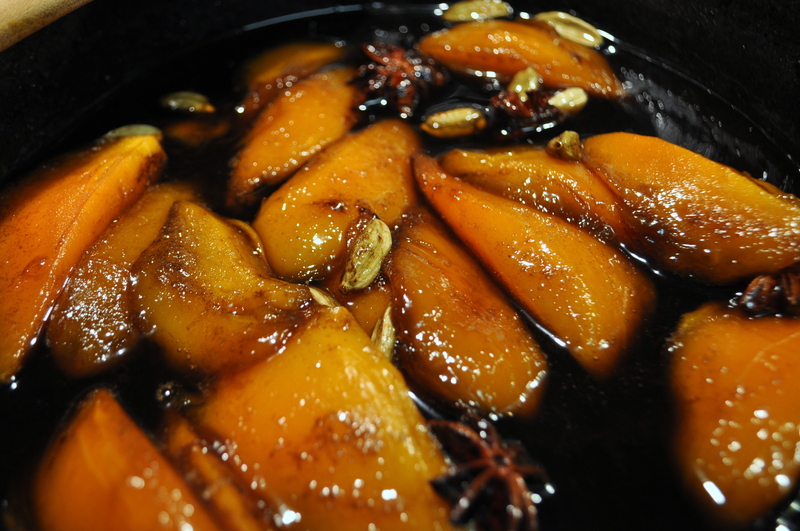 In this recipe, I made good use of two of these finds: green cardamom pods and star anise. They give the sauce, I won’t go so far as to call it a caramel because it is quite thin, a wonderful warm quality. You can make this dessert very quickly. It keeps in the fridge for a few days so make extra! You can either reheat it or eat it cold both are delicious. I plan on trying this recipe with other types of fruit when, and it breaks my heart to think about, mango season eventually ends (horror of all horrors, I know!). I can’t wait to try this with pears on a cool, rainy evening. When that day comes, I will be, as always, dreaming of mango season. wow .. this looks absolutely delicious ! Cant wait to try it with some ice cream. this is super interesting! I’m sure the spiciness and the roasted sweetness gives the rice pudding a completely different dimension! What an ingenious recipe! When I lived in Hawaii 50 years ago, I never developed a taste for them, but this recipe sounds very good to my more mature and adventurous taste buds. I enjoyed your post. I will be posting more on my recent trip to Honolulu.